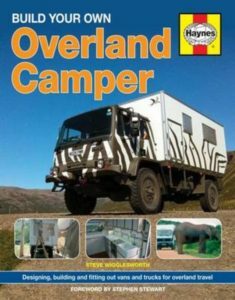 Build your own overland camper, written by Steven Wigglesworth, is to our knowledge the first English written book about how to build your own expedition truck / overland camper (please, kindly correct us if we are wrong). 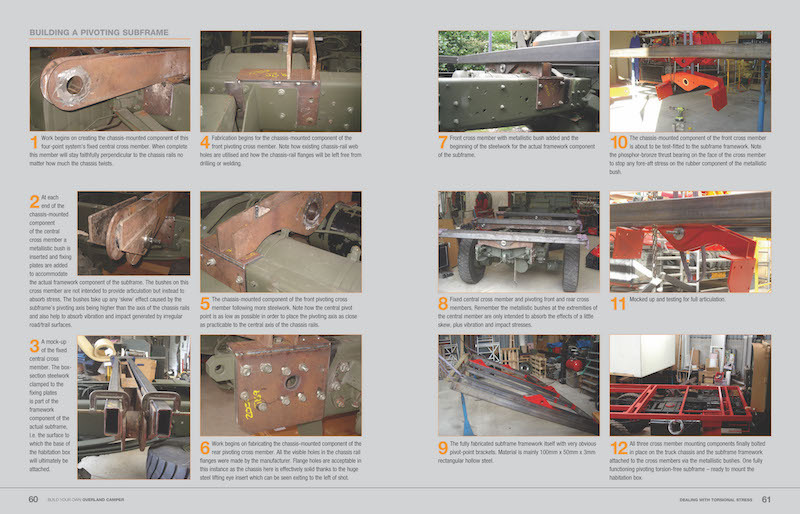 It is a compact -196 pages- book containing clearly written explanations of the different components of the build: from choosing the chassis to the interior finish. 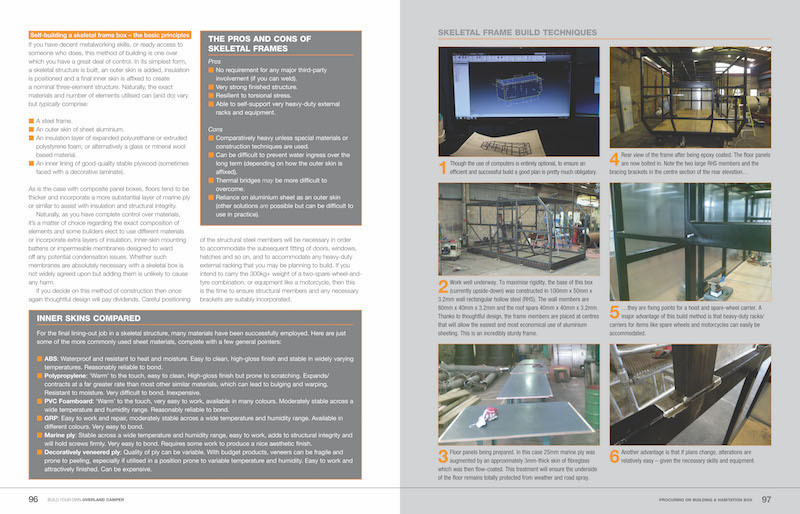 The conciseness of the book makes it a good starting point for each stage of the build. It discusses all the things one have to take in considerations, especially regarding the choice of vehicles and frames. However conciseness also entails you still need to do your own research. 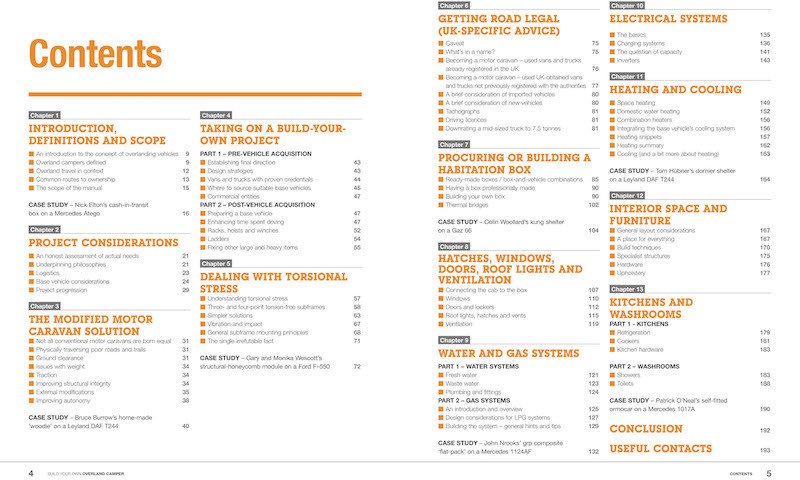 For example, the book only briefly discusses water systems while it goes into a more detail on the heating system. When you come at the point of deciding upon your filtrations system you still need to look up the different filtration systems on the market and figure out what works best for your needs and budget. Also in other chapters the author discusses some topics only shortly; e.g., for toilet solutions only the option of cassette toilets. What we like most about this book is how well and clearly written the book is. 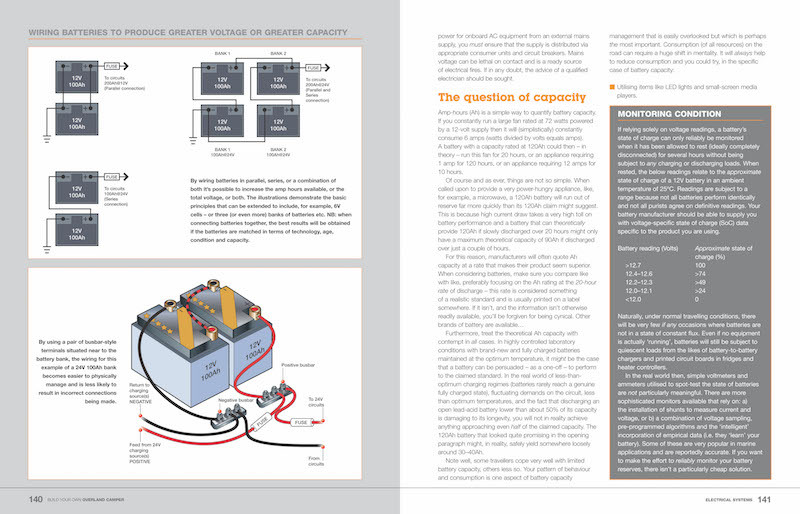 The clear diagrams and abundance of images support the text very well. 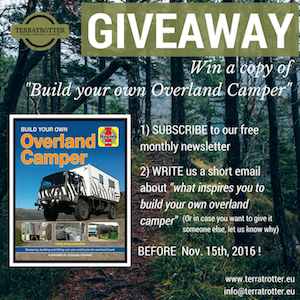 And the use of text boxes draws your attention to “pros and cons”, important information, hints and tips, … After reading the book you have the necessary knowledge to start your build-your-own-project or make well-thought-out decisions when commissioning (parts of) the build of your overland camper. 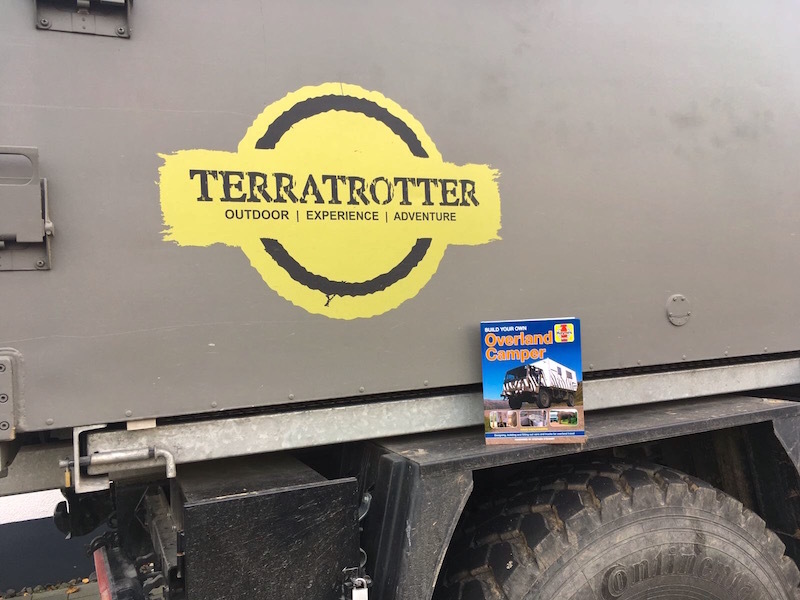 Overall, we definitely recommend this book for those dreaming or in the early stages of building an overland camper (even when it is not your first build). First of all. We want thank everyone participating in this giveaway. Bart Schiks, from France, can expect our copy from the book as our holiday gift. “Because I’m part of the circuit for years, and every time there is a reason not to start (not really because of a valid reason, but more due to practical matters). That is how we leave every time with an old Volkswagen van with a few boxes of kitchen utensils and food. After standing at the last Willy’s treffen with two small (army style) pup tents because I had nothing drivable that looks remotely like a camper, I had it with all the improvising. I’m also sick of searching time after time for my toothbrush or sleeping bag. That is why I want to build a vehicle where everything has its designated place. So that next time when we stand in the mountains or next to the sea we simply have everything with us, and know where to find it. How peaceful would that be, finally being able to truly enjoy the surroundings! We wish you lots of fun with your next build and look forward to see you on the road! Click here for more inspiring travel and how to books! For the review. I will be looking at it as well as Into the Americas. My biggest issue is finding the time to build. So I shower the internet for rigs already built that maybe I purchase and or research outfits who do the build. The ladder is a prospect but this too comes at a price. The folks in Nexus MI make a good rig, but would or could set me back a kings ransom. Recently I have found BlissMobil. What I like about them is they are taking a pre-built steel container and then building the infrastructure within. What I also like is the container can be moved anywhere with or without the platform and will basically fit any truck with the container mountings. 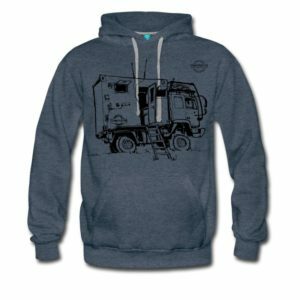 With this said I could then search for a reasonably priced newer used Unimog. Then register it in a foreign country which allows trucks of newer age. 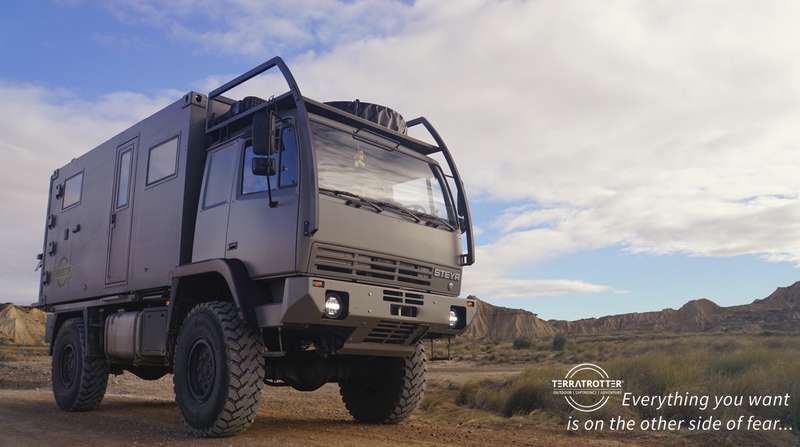 This truck can be driven in the US for up to a year in transition. Therefore I could transition it through the US via Canada. It is also my understanding that if it were to go to Canada for a few months the transition period could start all over again. Still researching this one. In reply to Geoff’s comment about taking a truck to the US for a year. I have been looking into this recently, as we are planning to move to the US from the UK and live in a truck. We currently live in a Sprinter in the UK but won’t be able to import the Sprinter to the US permanently, so the only option was the 1 year temporary (travel) import which you rightly mentioned. It was my understanding the vehicle had to leave the US but Mexico and Canada were listed as no being permitted for that. I would love to be wrong about that fact! Great website by the way guys. I came here after watching your Youtube vids. We totally understand the problem with finding the time to build. That is why after 2 years the truck is still not finished, but we are almost there. Our experience tells us that building your own does not safe you that much money necessarily. It all depends on what you can do yourself, what quality finish you want and if you let it build by someone else, the company. We can highly recommend Zepbox They also work with the container system and their product is priced very well. (PS: We don’t receive anything for promoting them. They are simply great people). Building yourself however does help with getting to know your truck (and how to fix it) and spread the cost over time. Bliss, they are not working with a pre build steel container, They build their frame themselves, and then they fill inn the gaps with insulated panels, Thereby using a very clever (for camper use) system for recuperating rainwater. but take care, they do come at a price! I think though ( being old scool) their use of all electric wireless appliances is clever and neat, but I’m very weary how it keeps up after years, and/or miles of hard travelling??? If you stay with K.I.S.S. (keep it simpel stupid) it is way easier to fix IF necessary.